Last weekend we got a great start on the garden. It took all day but it was fun to work side by side with my husband and kids. A little rain gave us plenty of breaks as it would come and go. 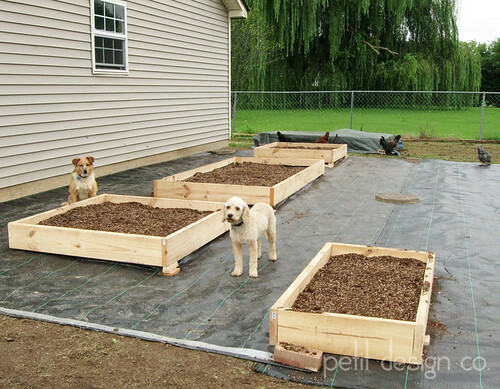 As I mentioned before, we are using the Square Foot Gardening method. First my husband and son rolled out some super heavy duty commercial weed barrier which we bought here. Then they built some grow boxes. While they were building the boxes I was out collecting the ingredients for the growing mix that goes into the boxes. 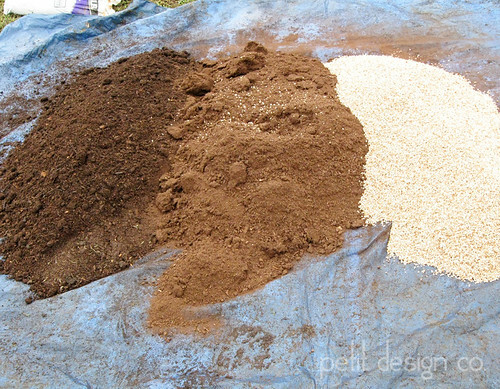 The mix is essentially 1 part compost, 1 part peat moss, and 1 part vermiculite. There is a little more to blending the compost, I suggest reading Mel Bartholomew’s book. It took a few hours to get all the ingredients blended in 5 batches and into each of the grow boxes. We ended up with extra mushroom compost and extra growing mix so we are saving that for future grow boxes. On Monday I was able to plant our seeds and a few tomato plants we found at Home Depot. We should be able to get a few tomatoes before the first frost. In case you are wondering, yes – chickens will eat and dig up your garden! We haven’t given ours the chance to do so. The boxes are covered with some frames we had lying around (I’ll share a picture later in the week.) 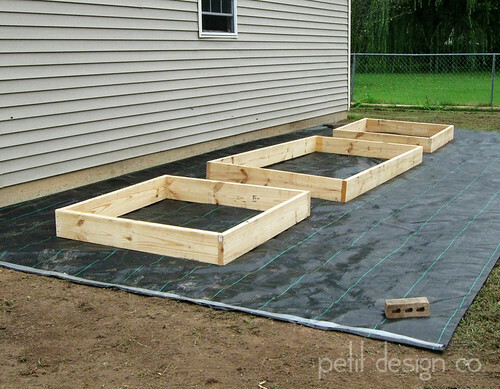 We have plans to fence off the garden area and lay down some gravel, probably, between the boxes. We will add an arbor on the right side of the small box and a little gat there as well. This coming spring we’ll add a few more boxes to the garden. Hopefully our little garden will flourish and it will truly be a garden of eating. This is looking so nice and your future addition plans sound wonderful! I planted cherry tomatoes in pots on our deck for the 1st time in years and just might have "eaters" next week. looks great. Fencing certainly is a must for the chickens. Can't wait to see it as it progresses.